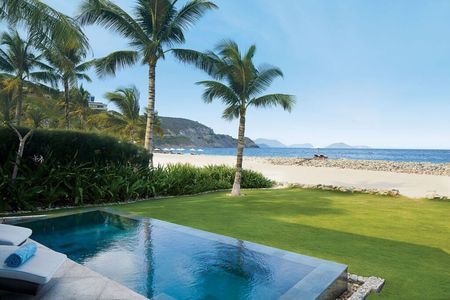 Tucked away on a breathtakingly beautiful cove, Mia is one of our all-time favourite beach destinations in Vietnam. It is the perfect luxury getaway for those who want to get away from it all. Mia is more than just a beachside resort. It has a vibe that will transform your Vietnam experience - from the beautiful natural decor of its villas to the fabulous lantern-lit cocktail bar on the cliffside (that would not be out of place in the swankier corners of Ibiza); it is a very special place. In fact, the only downside at all is having to tear yourself away at the end of the holiday. 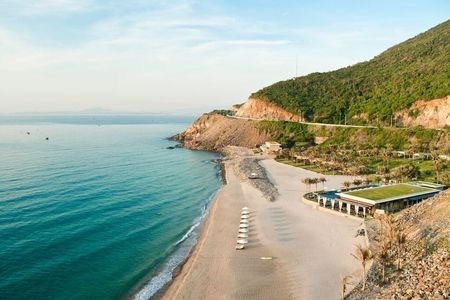 We adore the location of Mia; about 12km from the bustling beachside town of Nha Trang, it offers complete privacy and seclusion on a private bay with villas camouflaged into the cliffs, gardens and along the beach front. It's ideal for those that want to get away from it all - while still knowing you can jump in a taxi to town for a change of scene. There are three different types of accommodation on offer; condos, villas and suites - all of which are decked out in beautiful natural woods and colours that manage to feel like an extension of the ocean surroundings. The entry level rooms are the Garden Condos, which have spacious rooms with beautiful bathrooms in a building at the back of the resort's gardens, while the Ocean Condos offer exactly the same rooms but in a glorious location staring right out onto the sea. Some of these Condos have two bedrooms so are ideal for families. The next level up are Villas, which offer even more privacy, space and luxury. We love the finishing touches - like the huge stone mosaic wall made from the large stones from the ocean. The centre piece is a beautiful, huge four poster bed framed by light flowing material, which is draped from the posts. All villas have a day-bed at the end of the bed and open out onto a gorgeous terrace and garden with a private sitting area. 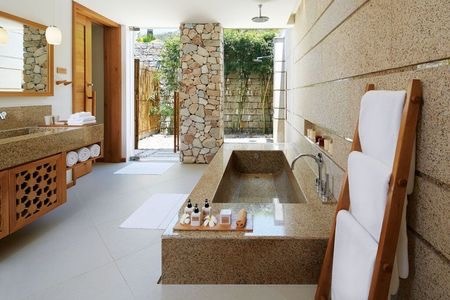 The bathroom, which is made from rough and smooth marble, is huge with a large tub and lovely outside shower. 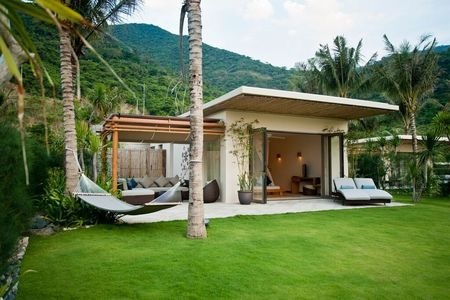 You can take a Garden Villa in the resort's beautifully manicured gardens, a Beachfront Villas or a Cliffside Villa. All offer the same exquisite design but the Beachfront and Cliffside Villas boast private plunge pools and spectacular locations (the cliffside villas have fabulous ocean views and more privacy but not suited to older people or anyone wants beach access from their front door). The third category of accommodation is the Mia Suites, which are nestled into the cliffside with fabulous views and best described as two villas connected with a stunning living room, so ideal for families or groups of friends. Finally, the resort also offers a spectacular five-bedroom Residency that sits in a prime cliffside location, and offers unparalleled luxury including a magnificent infinity swimming pool that sweeps around the entire property. Sandals, Mia's main restaurant, looks out to the Ocean and offers a wonderful collection of international, western and Vietnamese dishes. The wonderful chilled out lounging and dining area spills out to the beach front for alfresco dining at any time of day. 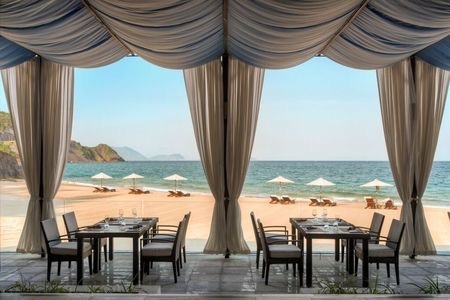 There is a second restaurant at the resort, La Baia, which serves authentic Italian cuisine and some of the best seafood options available in Nha Trang. Meanwhile, its Mojito bar up in the cliffs (a climb up 100 plus stairs or a short golf buggy ride away) is one of our favourite bars in Vietnam. Decked out in huge cushions and lanterns with a wonderful water feature, it looks out to the Ocean and has fantastic cocktails on offer. Mia has an idyllic spa and a lovely swimming pool beside the main restaurant. A good section of the cove is ideal for sunbathing on the pristine white sand and swimming (while the other part is stony). It is in a prime spot for snorkelling and kayaking, which can easily be arranged at the resort. 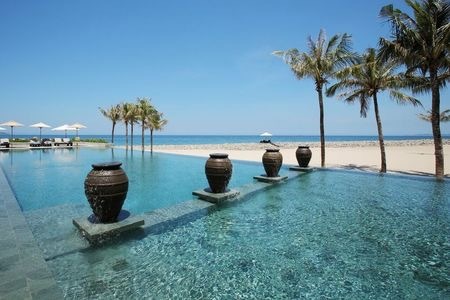 The hotel is about 12km from the beachside town of Nha Trang, which has plenty of shops, bars and restaurants - and it is about 18km from Cam Ranh International Airport.